On a whim I bought some pole mount GPS receivers. Being unable to find any real details on what's inside I mostly bought them blind, so I took some photos of the insides to help others out. 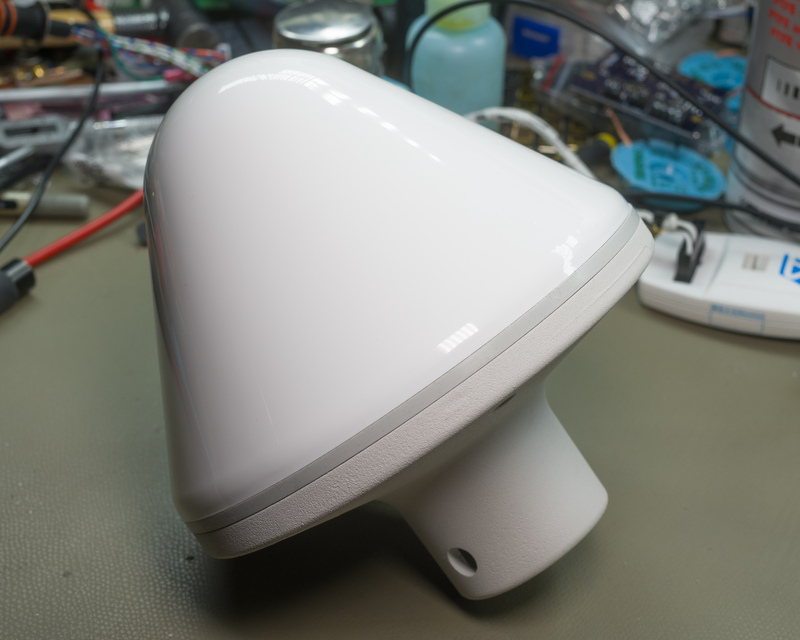 Pole mount GPS receivers are for some reason a fairly common option compared to external active antennas. It might make sense to use these instead of antennas since they can be upgraded more easily as new types of timing sources become available. Both types shown below are GPS L1 only (though the HP has SBAS, a feature that isn't normally used for timing since it degrades accuracy; it might improve initial lock times though). They are probably so cheap now because multi-GNSS receivers have become more common. A standard 12 pin connector is used on these devices, it's surprisingly hard to find and the cable to connect to the receivers will probably cost you more than the receiver. Caveat emptor. This one was bought a new-in-box (I've also ordered a used one in case I need spare parts. Cost was around $90 but that included TNT shipping so it got here pretty quick, and it certainly looked new in box. Note that new in box doesn't include mounting hardware or a cable kit (just a lead with the connector on it). Used ones sometimes have the cable cut at the base. The -H01 suffix seems to be a cost optimized version with newer hardware, older pictures I found had different internals and the castings support that as well. The unit is pretty simple to disassemble, just a set of T15 screws along the bottom. 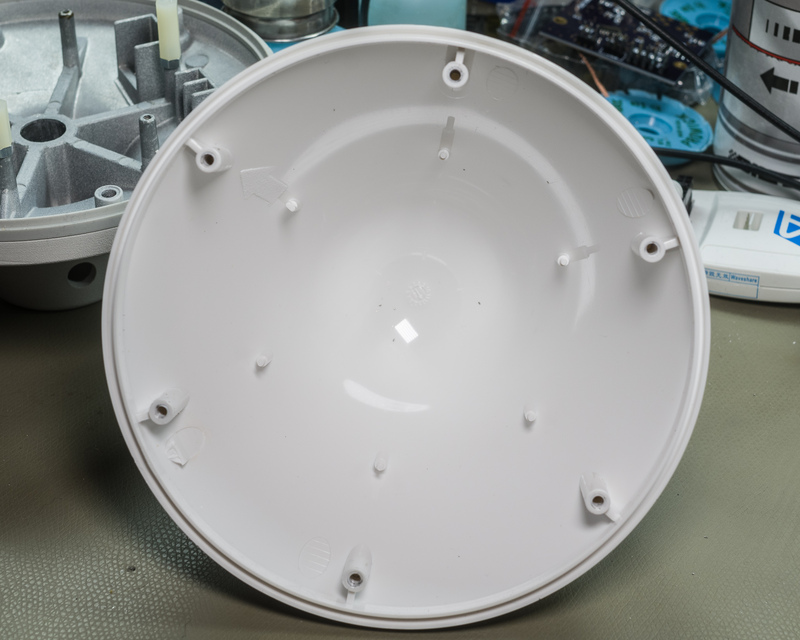 The light gray part between the radome and base is a gasket that fits in grooves in both sections. There's an integral plastic collet to grip a pipe, it's tightened with an ~M8 DIN912 screw (i.e. you need a 6mm hex key to tighten it). The base is metal, it looks like a high-zinc content aluminium casting with a grey/white paint. The casting clearly shows that it was made for something slightly different. 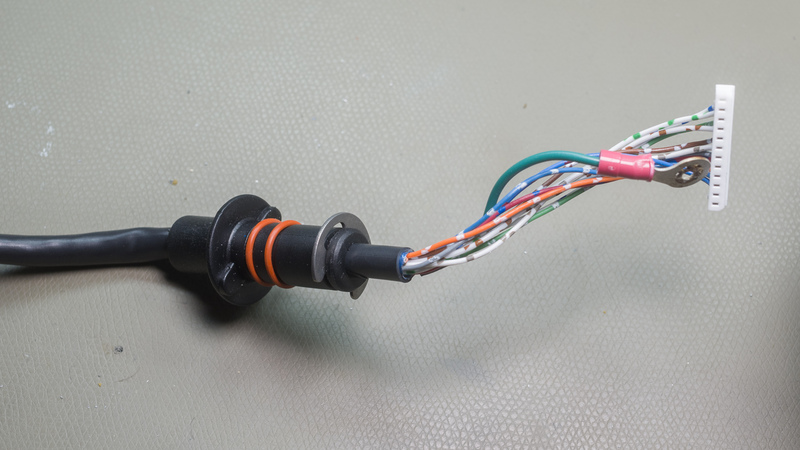 If you need to replace a cut-off cable, I'd suggest tapping the center bore to M16x1.5 and using a cable gland as the cheapest option. 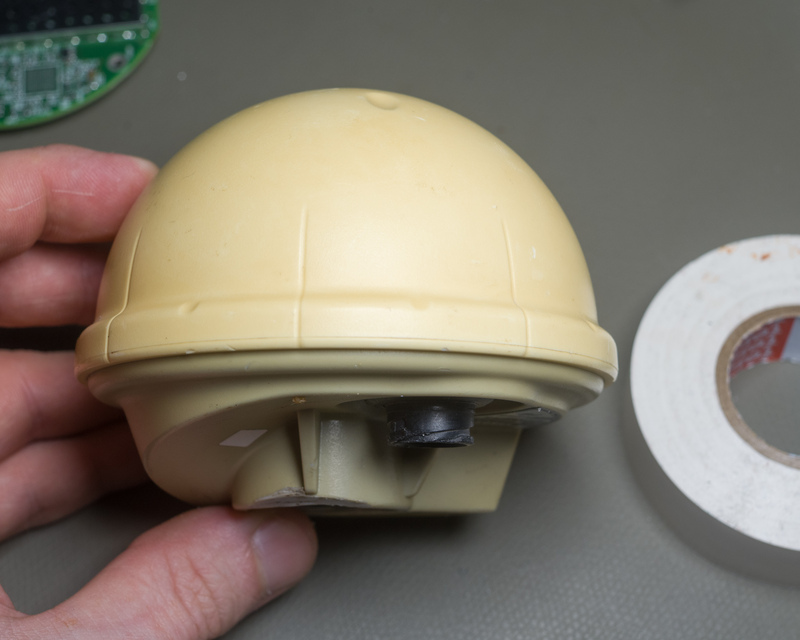 The plastic pegs inside the radome are clearly where the antenna PCB used to mount. The pegs are on a 90mm diameter with 2mm holes except the key slot, which is around 2x4mm. The screw mounts are self-tappers (~3-4mm) in plastic. They are a good fit for a M3 helicoil. Bottom of unit showing markings. Pipe clamp removed for this picture (see below). 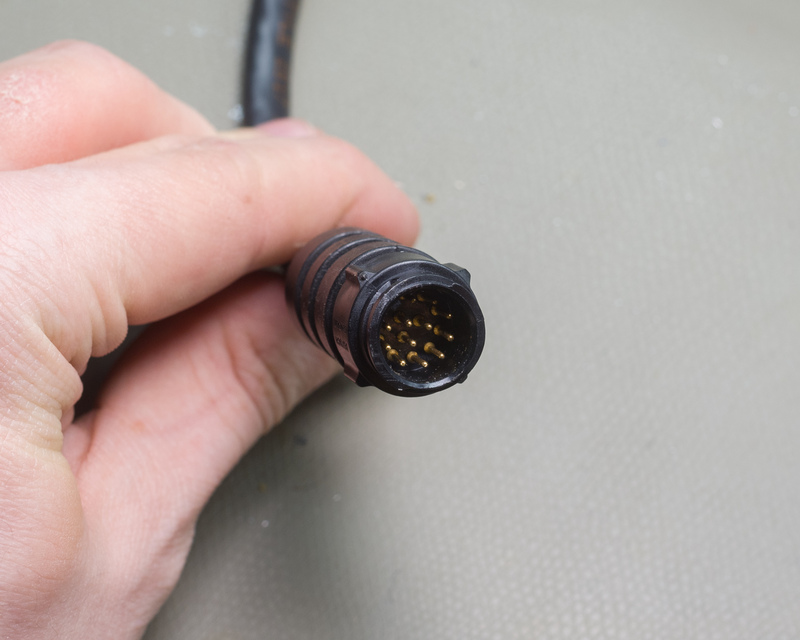 The cable with connector is integral to the unit, but can be removed without damage. 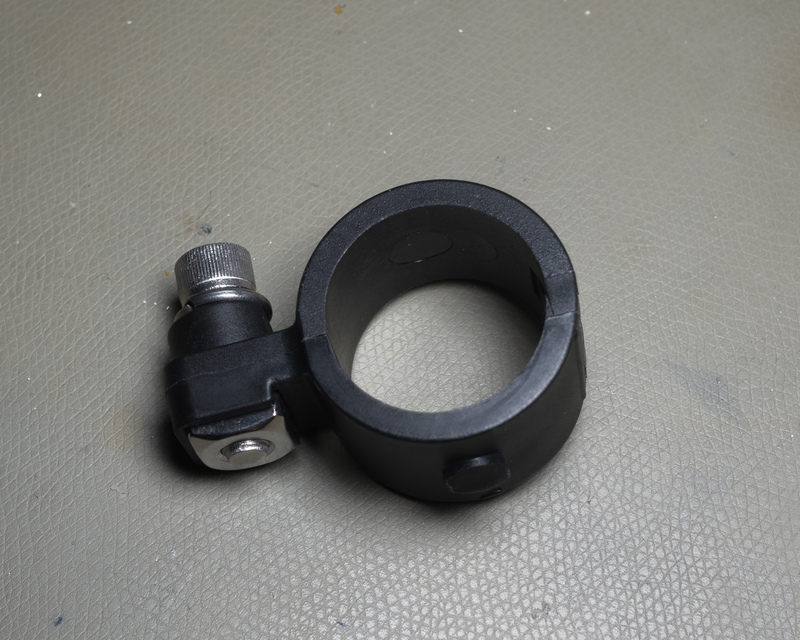 The two o-rings fit inside the casting bore (~14mm) and the E-clip is just above the hole when installed. Not a bad solution. The grounding strap is connected to the cable shield but I'm not sure where the shield connects to elsewhere (the external connector is plastic). It was screwed down to one of the spare PCB mounting holes originally. The cable assembly is fairly stiff to handle. Unsurprisingly the PCB is all one unit for this version. The top has a basic patch antenna. No surprise to find RS-422 drivers, a power supply, and input protection. A nice feature is a 0.47F 5V supercap for the GPS which will probably provide reasonably fast acquisition if power is lost temporarily. 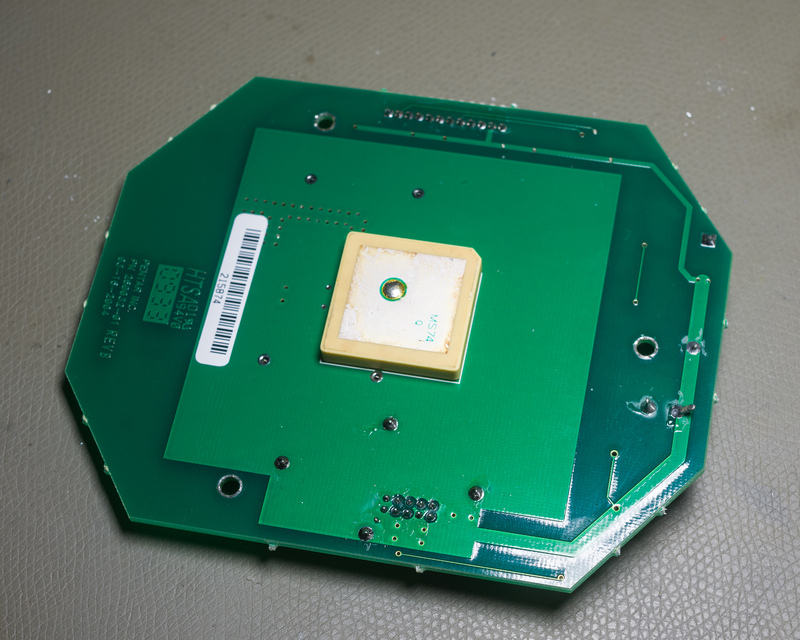 I didn't take apart the shielding but the large shield is almost certainly antenna matching, SAW filter, and LNA. 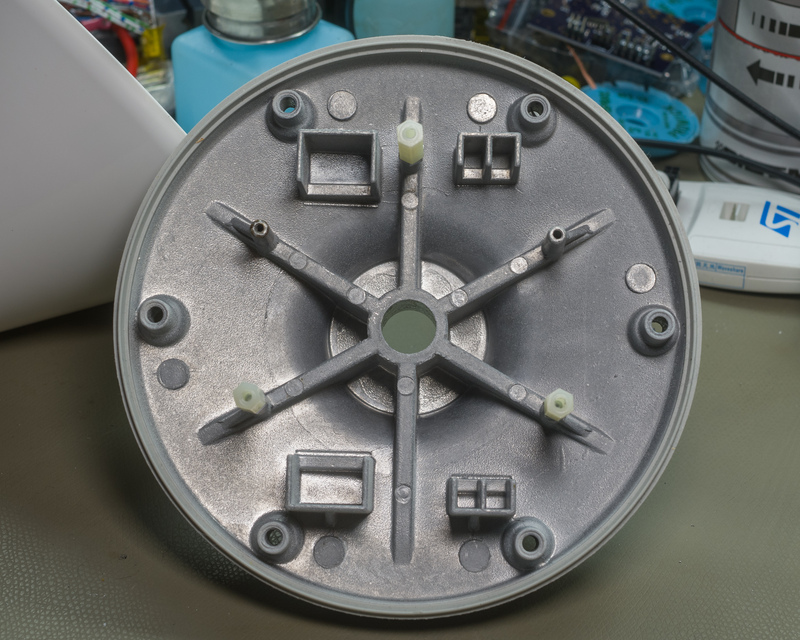 It seems like a pretty big shield for what is typically a fairly small amount of circuitry. 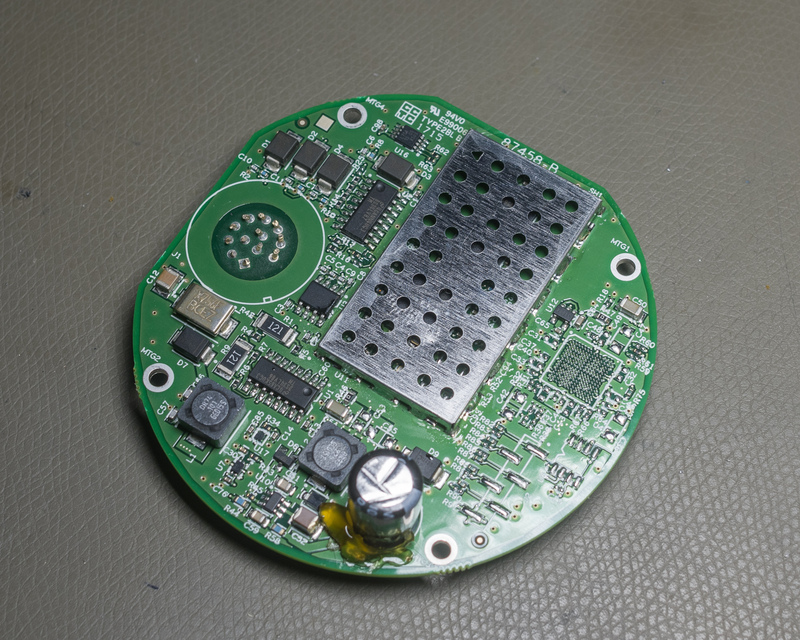 The GPS is tack-soldered to the board but probably fairly easy to disassemble. 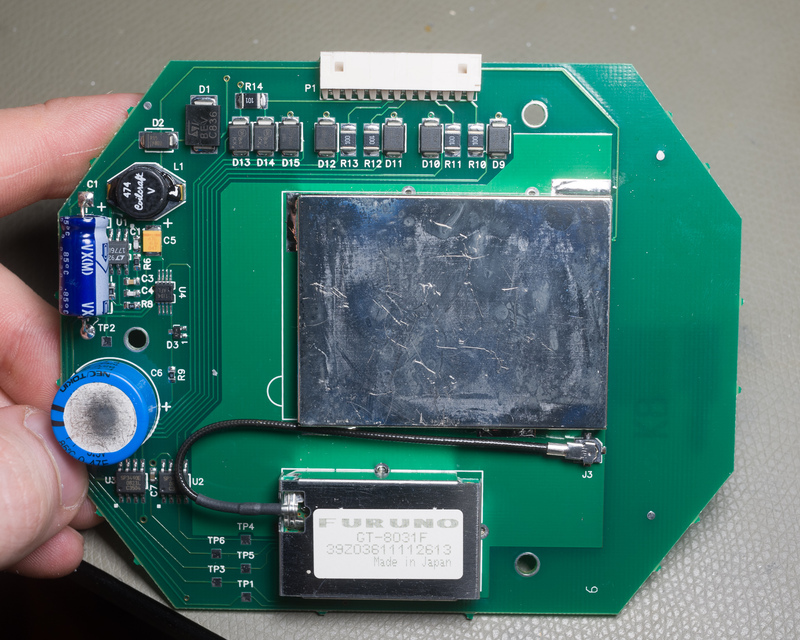 Looking around it looks like this module was also used in other GPSDO clocks from HP around the same time. The Acutime Gold is from what I can tell the second product in the Acutime lineup, succeeding the futuristic Acutime 2000, and preceeding the Acutime 360 which is a multi-GNSS receiver. These were pretty cheap, I bought two used. The markings suggest mine were used with Huawei equipment. As I said, these were used, and they show it. What RAL-code is "Nicotine" again? It's a much smaller device than the HP unit which is nice. Mounting is via a 3/4" pipe thread (which is, as you'd expect, 1" across, wtf pipe threads). Casing is all plastic and there are no screws except a nut on the signal connector. Unlike the HP unit, Trimble doesn't seem to care about serviceability. There's a thick glue seal around the entire casing holding the upper radome in place. Prying this apart seems mostly impossible without severely warping the plastic or fabricating a special jig to apply even pulling force around the entire base. Applying heat could also work to loosen the glue (but you wouldn't want to melt the plastic, so be careful). Needs must, I sawed the top off one of the units. During disassembly I also sheared off the external connector from the PCB. This is basically the same device as the HP unit but much much smaller. 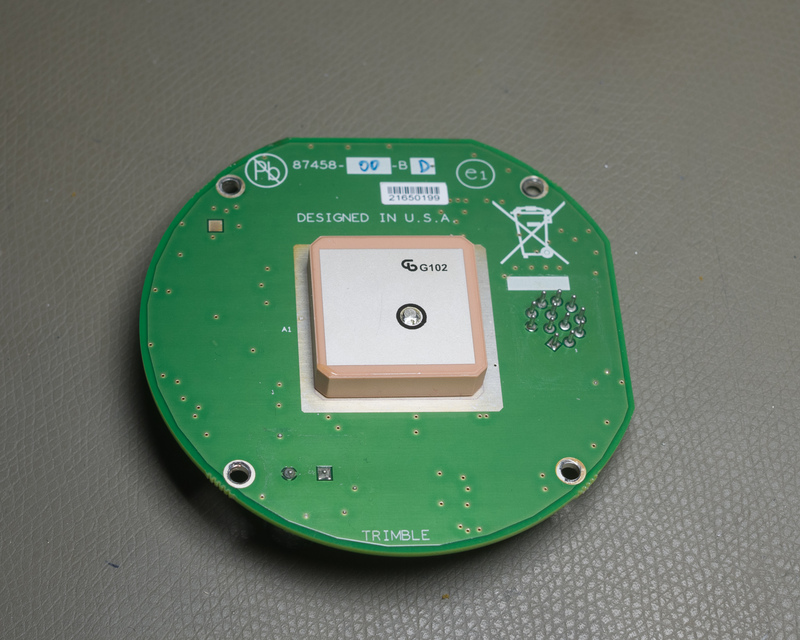 Since Trimble makes GPS receivers they are probably in a much better position to miniaturize the components. They probably have a larger volume as well. There are some unpopulated components on the side including a BGA footprint, not sure what that is for. 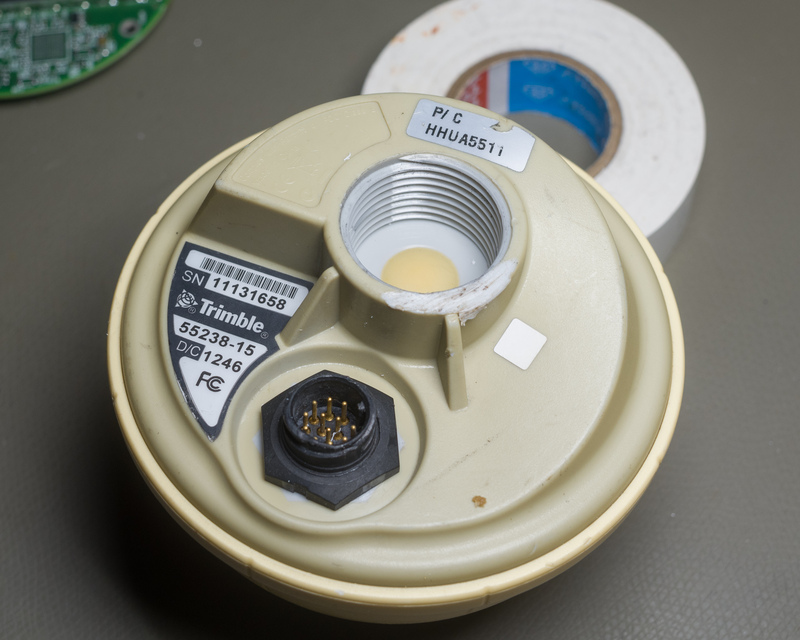 The HP and Trimble units are the easiest to get pole mount GPS receivers on the used market right now (march 2019). If you want to hack it or replace circuitry, get the HP. It's a far easier unit to work on since disassembly is non-destructive. If you just need a receiver, the Trimble is probably a good choice since it's tiny. 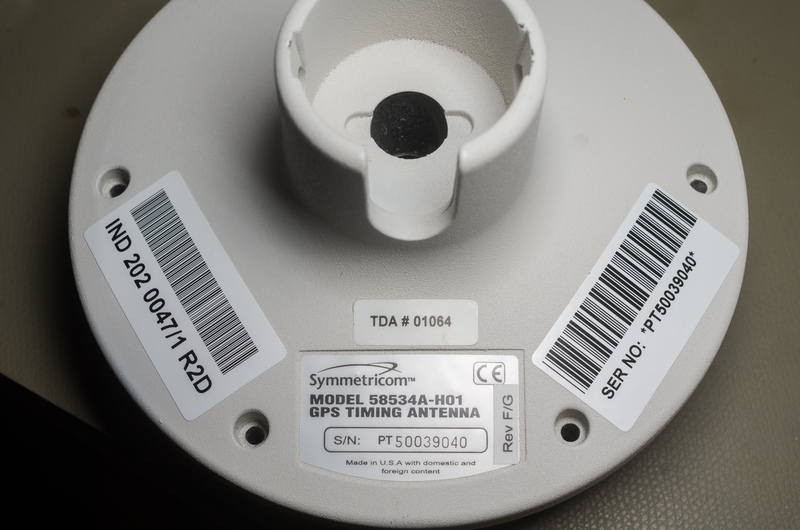 However it's far far cheaper to buy a normal GPS receiver and a nice active antenna if you just need a GPS L1 receiver.